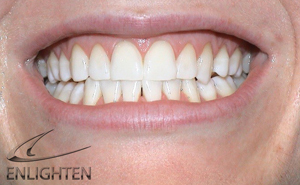 Enlighten Tooth Whitening at Orgreave Dental Surgery in Sheffield uses the ‘deep bleaching protocol’ developed in the US by Dr Rod Kurthy, and marketed in the UK by EnlightenSmiles, your teeth can be significantly whitened, normally to shade B1. With a unique gumshield production system, normally worn overnight for two weeks, your teeth are ‘primed’ before an hour’s ‘boost’ in the dental chair. In our hands, Enlighten has given the best results of the three systems available to you. Enlighten have their own patented desensitising agent, Aquaseal Benz, included in your kit. Your usual investment would be £550 for Enlighten and 3 appointments at the practice, one lasting 75 mins. 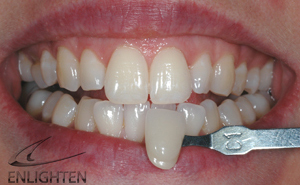 “I have been considering having my teeth bleached for quite some time, but had heard many stories about teeth sensitivity during and after the treatment. However, after consulting you during a routine check-up I was put at ease, informing me of the Enlighten system, explaining that the product had excellent reviews, results and benefits and caused very minimal sensitivity. I decided to go ahead with the procedure. During the treatment the quality of care throughout has been fantastic, the process has been explained step by step and any questions were answered clearly and professionally. Each process was easy to follow and any questions answered in an informative and understanding way. The reception staff and dental nurses at the surgery are also very professional, organised and friendly. 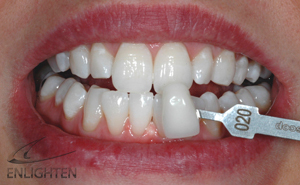 The Enlighten system has been very straight forward and well worth the time, cost and commitment, from the first appointment where the personal trays are made through to the final appointment. I have enjoyed noticing my teeth lighten in the first few days of using the bleach each night, the results are amazing in a short time and virtually no sensitivity experienced. Having whiter teeth certainly improves confidence! The process and outcome have been exactly as you first described. Thank you for your care and advice. I am delighted with the outcome and I would recommend the service at your surgery. 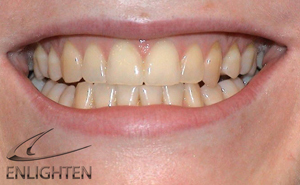 The Enlighten system is a superb investment and the brilliant results are easy to maintain. Anyone considering teeth bleaching should contact you.